Requires SMART Notebook® software (not included). US English language resources. US Edition. Use is subject to the terms of the License Agreement. JUMP Math Digital Lesson Slides (US Edition) require SMART Notebook® software (not included here). The efficacy of JUMP Math's Teacher Resources is now amplified by the power and convenience of interactive whiteboard software. For every JUMP Math lesson plan there is a perfectly-aligned interactive whiteboard file, complete with teacher prompts, sample questions, drawings, extensions, activities and bonus questions. 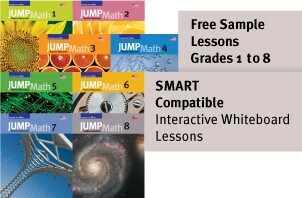 Further, the JUMP Math SMART Lesson Materials integrate the many exciting and interactive tools and options inherent to this technology, while maintaining perfect alignment with the JUMP Math philosophy and publications. In keeping with the JUMP Math philosophy, color, artwork and other distracting features have been kept to a minimum. Using interactive whiteboard-ready lesson materials based directly on the JUMP Math lesson plans reduces lesson preparation times, enabling teachers to devote more time and energy to reaching and teaching every child.